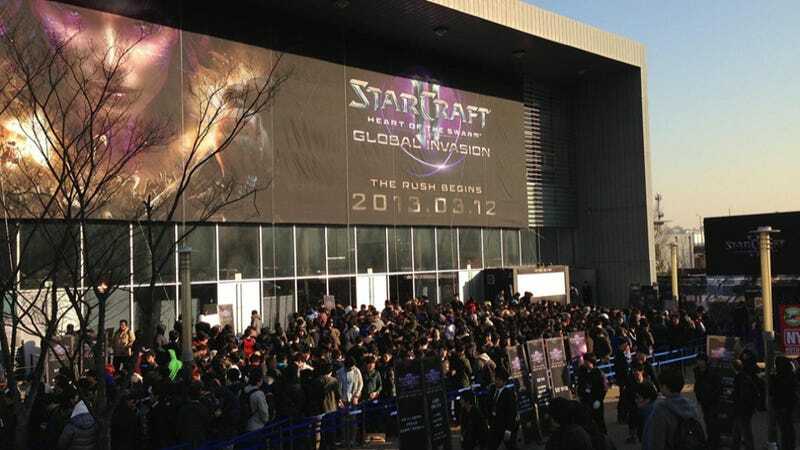 StarCraft 2 expansion Heart of the Swarm is launching in South Korea. Some gamers are very excited! Others are excited, too, but also totally ticked off. Besides concern over whether or not fans can get the special package game, there's also concern about a flood of non-gamers trying to snap up these physical copies to auction them off. But the biggest fuss by far is about what Blizzard is calling the special package version. Blizzard is calling the special version, roughly, the "Keepsake Edition" (소장판). Thus, gamers are upset because this edition is actually limited to two thousand copies; however, Blizzard is not using the words "Limited Edition" (한정판), which is common in Korea for, well, limited editions. As Kotaku reader Sang Kwon points out, this language is also used for the equivalent of Collector's Editions, to underscore the "limited" nature. So it's not fair to necessarily equate Keepsake Edition with Collector's Edition. Generally, in South Korea, Limited Editions and Collector's Editions are referred to by the small thing ('한정판' 한정=Limited 판=Edition). However, sometimes, Sang points out, "Collector's Edition" is written out phonetically in Korean (콜렉터즈 에디션/Kol lec tuz Eh di tion). That being said, in Korean, Blizzard is calling this the "Keepsake Edition" (소장판), but in English, it's "Collector's Edition." The point of dispute is the word "limited". That's what everyone is getting hung up on! And perhaps you can see why: Even the special Diablo III edition had "Limited" (한정) in front of "Keepsake Edition" (소장판). Over on the Korean Battle.net, commenters aren't exactly happy about the "Limited Edition" omission for Heart of the Swarm. Wrote one commenter, "They should add the word 'Limited.'" Added another, "There is a typo. It's not 'Keepsake', but should be 'Limited.'" Yet another quipped, "So I should be able to buy this whenever since it doesn't have the word 'Limited.'" And one commenter pointed out, "People outside of Seoul have almost zero chance of buying one." That's not exactly true, as the Keepsake Edition will be available through retailers like Lotte Mart and Home Plus; however, they will be available in limited quantities only. It's all rather convoluted: There are two thousand Keepsake Editions at the launch party in Seoul; then, there are three thousand available through online retailer Auction; and then, there is apparently an unspecific amount available through select convenience stores. The whole thing sounds like a confusing mess. If it's limited, then slap the word "limited" on it. If you're going to stoke demand by saying there's only a limited number of packages, then give those who stand in line the satisfaction that they do indeed own a limited edition product. In case you are interested, you can watch the launch here on Twitch.